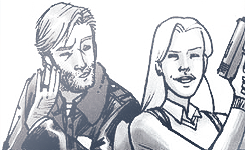 【Comics | mostrar 】. . Wallpaper and background images in the Los muertos vivientes club tagged: the walking dead rick grimes andrea andrew lincoln laurie holden. This Los muertos vivientes fan art contains animado, cómic, manga, historieta, anime, and dibujos animados.